New renders of the Nokia 9, also known as the Nokia 9 PureView, have surfaced – and while they seem to confirm some of the biggest rumors surrounding the phone, they also dispute a few. The Nokia 9’s main point of interest is its penta-lens rear camera, which various rumors have alternately touted and debunked. 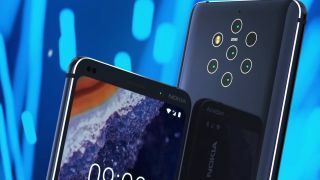 The new renders, via Pocketview, suggest that they are in fact part of the device, and will range in power from 12MP to 5MP, although the resolution of one of the lenses is still unknown. The front camera, meanwhile, will be a single-lens 12MP snapper, according to the leak, which is in line with previous rumors. What 5G phones are we expecting in 2019? Another rumor that’s backed up here is the inclusion of a fingerprint sensor embedded in the Nokia 9’s front screen, with the images seeming to show an unlock icon on the screen. The screen itself is said to be 5.99 inches, which is in line with other leaks we’ve seen, although we’ve also seen a 5.7-inch screen rumored. According to the report accompanying the images, the Nokia 9 will have a 4150mAh battery. This is inconsistent with previous rumors, which had it at 3800mAh, while there’s no mention of fast-charging or wireless charging. One major design change we’ve not seen rumored before is the absence of a notch, which, according to these renders, has been replaced by a large bezel at the top and bottom of the device. The former houses the device’s front camera, but the latter is likely in place to reduce production costs as trimming the bezels further would require additional expenditure, which could increase the final Nokia 9 price. This may be a sign that the Nokia 9 will launch with a slightly cheaper price tag compared to the likes of the iPhone XS and Samsung Galaxy S9. We’re expecting to find out about the Nokia 9 on February 24, after HMD Global's Chief Product Office teased the date in a tweet. That’s the day before the official start of MWC 2019, although nothing is certain at this point. Assuming it is indeed launched at MWC we’ll be there to bring you all the news.